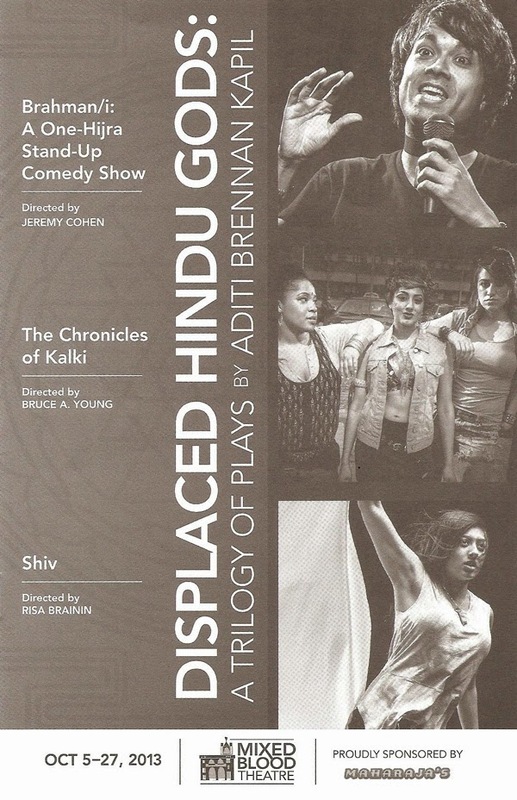 Theater artist Aditi Kapil (aka Diana in Next to Normal) has written three one-act plays based around the trilogy of Hindu gods: Brahma (the creator), Vishnu (the sustainer), and Shiva (the destroyer). The plays are set in modern times with very modern characters, but all contain mystical elements. Recurring themes that tie the three very different stories together include the colonization of India, the formation of the Himalayas, the naming of Mount Everest, water, and the intervention of gods in the lives of mortals. With overlapping casts and similar sets, the plays are presented individually on weeknights, with all three being performed on the weekend. Each stands on its own, but I really enjoyed seeing all three in one day and making the connections between them. They're all so different - one a stand-up comedy routine, one about a couple of misfit teenage girls, and one a gentle love story (of the romantic and parental kinds) - but they work together to create a larger whole. Presented as a stand-up comedy routine, Brahman, aka Brahmani (Debargo Sanyal), tells stories and jokes about growing up as an intersex person in an Indian-American family. Some stories are typical of any young person (the trials of middle school humiliations), and some are not (being asked at 14 to choose whether to live as a girl or a boy). B mines much humor from the awkward teenage years and a large crazy family, as well as the history of India. An except of the piece was presented at the Ivey Awards last month, and now the mystery of why Peter Hansen was randomly playing bass guitar has been explained. Turns out he's not just there to provide a musical backdrop to the comedy routine, but he also plays a character who adds greatly to the story - B's friend/lover who is one of the few people who "never asked you to choose." Debargo gives an incredible performance, so vulnerable, funny, physical, and heart-breaking, speaking in many different accents, from British to Indian to bored teenager. B's story, while in some ways unique, is also a universal story of someone struggling to define their place in the world when they don't fit into society's strict molds. Two teenage girls (Cat Brindisi and Joetta Wright) in anywhere, America are visited by Kalki (Lipica Shah), an avatar of the god Vishnu. She appears to them as a pink-haired outrageously-dressed transfer student, and after an incident and her sudden disappearance the girls are questioned by a detective (Andrew Guilarte). The story is told in flashback as the girls reluctantly tell the cop what happened. Cat (who's never less than 100% committed to whatever character she's inhabiting) plays a tough girl who tries to get in with the popular crowd to disastrous effect. The fearless Kalki helps the girls seek their revenge (a little like Carrie), appearing when they need her and disappearing just as suddenly. In the final play of the trilogy we meet Shiv (Lipica Shah, playing a completely different character in look, voice, and personality). The play flashes back and forth between her loving relationship with her father growing up (Andrew Guilarte, also completely different in this incarnation), and the present, working as a caretaker at a fancy estate on a lake. Her employer (Nathaniel Fuller) is mostly absent, leaving her to explore the lake with only his nephew Gerard for company (Peter Hansen again). Something has happened in between the two time periods that separate them, and in this present time Shiv is trying to heal. The only connection between the two is her mattress, which gets more and more cluttered as the play goes on and her complicated past catches up with her. Both of her relationships, with her father and with Gerard, are so compelling and lovely, but not as simple and easy as they first appear. It's a very real, sweet, earthly story, and then it takes a turn into the fantastical as Shiv flies into the cosmos on her mattress. So that was my spontaneous Sunday afternoon at the theater. I was glad to check one, er, three, more shows off my list, and I'm always happy to support Mixed Blood Theatre, a theater company that is dedicated to and really lives up to their commitment to diversity of all kinds in the theater. This was my first time taking advantage of the "Radical Hospitality" program, in which anyone can get in to see any of their shows for free if they show up within two hours of the show and there are still seats available. Yes, I experienced a five-hour theater marathon for free (which just means I'll donate more on Give to the Max Day). It was an epic day - great stories; fascinating characters played by fantastic actors; a wild, funny, and moving ride.